"I believe a great design stems from communication with my clients and keeping the design functional for the their specific needs. Whether it is a small or large space, creating a design that will bring organization and take care of the clients' necessities is very important to me as a designer. I think its important to create a solution that is practical but yet aesthetically appealing. Working through options to get it just right and giving the client exactly what they need is my goal." Vanessa Ruiz is one of Closet Works most promising young designers. 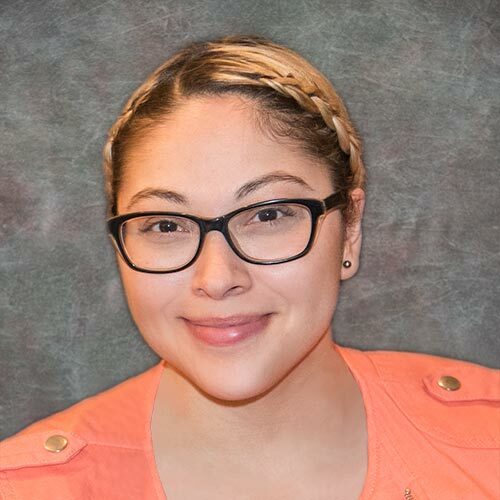 With an amazing sense of style and uncompromising attention to detail, Vanessa consistently provides the optimal solution to client storage and organizational needs, striking the perfect balance between form and function. 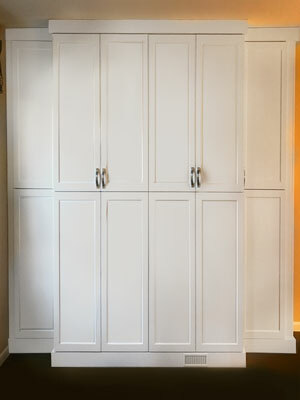 This walk in closet has been masterfully crafted in a White Chocolate laminate with bold Square brushed chrome hardware. Regal open frame doors hold elegant glass inserts for an exquisite touch to the double closet hutch. Alongside the center hutch is extensive shelving for organizing shoes and double hanging rods. 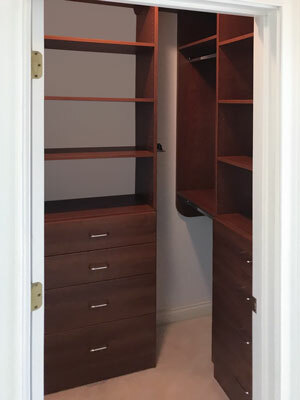 This custom walk in closet is an exhibition of creative solutions to cater to a client's personal storage needs for hanging and folded items and organizing shoes. With four pull out shelves, folded sweaters and shoes can remain easily accessible from top to bottom. Double hang extends into an alcove, maximizing the amount of hanging space in a compact walk in closet. Additional adjustable shelves are provided for further folded items and an extensive shoes storage. Paired with elegant oil rubbed bronze rods, the cocoa bean laminate evokes the natural beauty of wood. 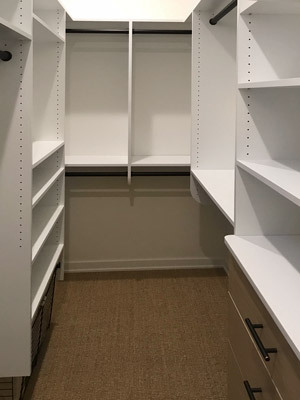 A compact space need not be labeled as minimal storage — small spaces can offer more storage than thought possible with a proper organization system. This design is arranged to maximize the space with double hang stretching into an alcove created by the open space left by the positioning of the dresser/shelving unit. In a Corretto Cherry laminate with standard handles, this organization system has an adaptable aesthetic that anyone could be pleased with. 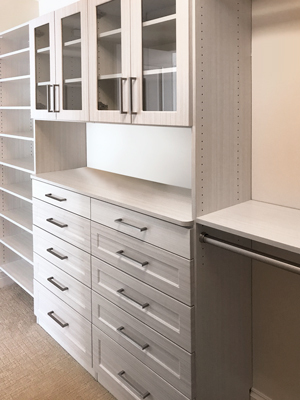 This walk in closet is striking for a number of reasons — whether its the fine construction details, the built-in desk, or the resulting unique aesthetic of combining laminates. The design uses Casting at 1st Light drawer faces, a VIVA laminate option to complement and give pesonality to an otherwise stark white closet. The corner desk rests alongside the window and provides a workspace in close, peaceful quarters. As part of a complete walk in closet design, this built in closet dresser is not only compelling, but fully practical to the living space. The base is scalloped to allow air from the vent to escape from behind the design. As a built in, the need for large bedroom furniture to take up space is no longer an issue. Casting at 1st Light drawer faces and oil rubbed bronze hardware hint at a dynamic, but still neutral aesthetic that would match with most decor. 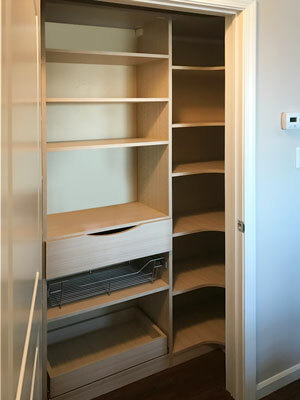 A further look into this walk in closet displays the variety of storage methods for top closet organization. 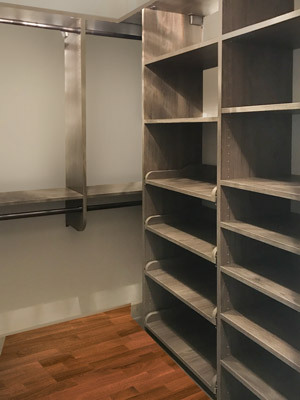 Double hang rods in oil rubbed bronze offer space for hanging clothing, a variety of shelves are offered for folded clothing, and drawers are provided for undergarments, socks, pajamas and more. Drawers are in a special Viva laminate Casting at 1st Light to create an stand-out, but certainly not overpowering accented look for this walk in closet. 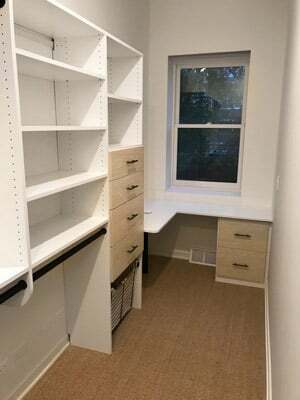 This walk in closet successfully takes a narrow space and offers an organization system that takes full advantage of the available area. 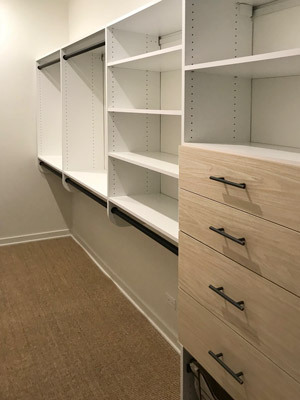 The design creates an alcove in the back of the closet for double hang and provides additional balanced hanging and shelving units along the narrow walls. Oil rubbed bronze hardware and rods contrast elegantly with the white and are an artistic accent against the Casting at 1st Light drawer faces. The simplicity of this design makes it a true marvel to look at. 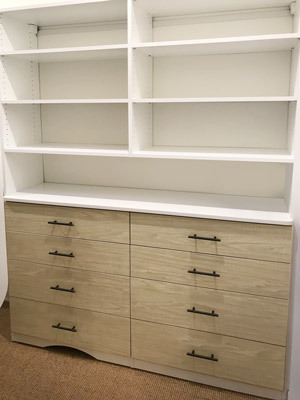 Assigned to a master bedroom, this unit increases storage and eases organization unlike any store-bought furniture. As a highlight of this custom design, the unit is outfitted to leave access to the vent, providing an opening for airflow. The strap handles add a modern element creating this wardrobe into a transitional masterpiece. 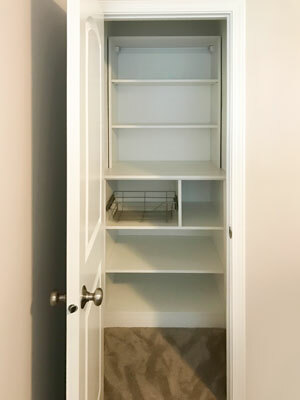 Linen closets can easily get cluttered with items becoming lost in plain sight. This simple organization system offers spacious shelves and compartments for stress-free storage. A convenient wire basket is provided for commonly used toiletries. A laundry room organization system can make a world of difference in the home. 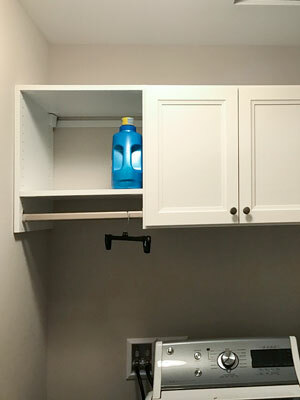 With a proper place to store detergent and hang clothes, the arduous task of doing laundry is a lot less arduous. The custom cabinets are a bright white with Villa faces. The hanging rod is an oval, brushed chrome rod. 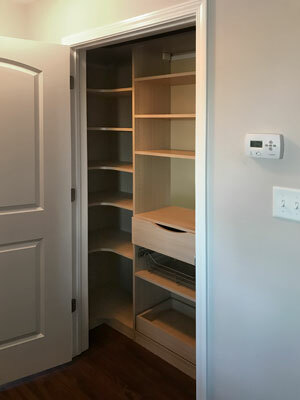 This organization system is in a calming Summer Breeze laminate and has accessories and assets to make pantry organization easier than ever before. The curved shelves maximize pantry storage along with spacious shelves, a large drawer, and pull-outs. The wire basket is perfect for small, frequented snacks and the bottom pull-out shelf slides out so you don't have to rummage through items. A further look into this pantry displays the depth of the storage the curved shelves offer in this design. The curved shelves expand the space in what would be a dark and cramped corner. This dual-purpose design has a luxurious charm that transforms this guest room into a treasure trove. 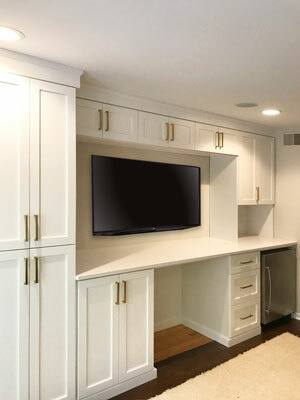 The Unity wood fronts, Silestone countertop, and gold hardware create an upscale, transitional look that will be sure to withstand the test of time. This living room fireplace surround design has incredible attention to detail spanning wall to wall with decorative panels, glass inserts, LED lighting, and more. To complete the beautiful transitional design, the countertop is an Alder wood stained with Cocoa. 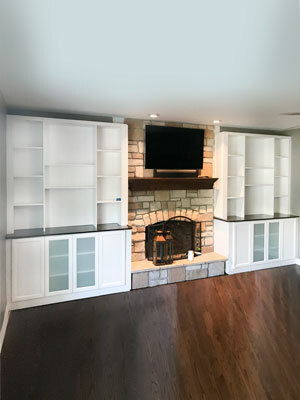 The shelves have been arranged in a unique way to be the perfect fit for the client's décor.